Photography, as with any pursuit, has its share of trends and fads. Trends — the direction the technology and art is moving, change the way we think and how we create. Think in-camera metering, autofocus, color film, then the move to digital capture and post-processing. Each of these transformed the way we create images. Fads usually have more to do with photographic styles, some style or method of making images becomes popular, but eventually gets replaced with another momentary shiny look and then goes away. One of the most common questions I am asked in my workshops and at the studio is whether mirrorless systems are a trend or a fad? Then, are any of the mirrorless systems available today well suited to nature photography. I’m never one to shy away from new tech and gear. I have wondered the same myself for a while. I think the answer to the first is a resounding yes, mirrorless is a trend, and a positive one, that will only get better. It is absolutely changing the way we do photography. But, I wasn’t so sure on the latter, whether these mirrorless systems would fit the demanding needs of wildlife and landscape photographers. The Olympus 40-150, became to be my favorite “go to” lens. Fortunately, I had the recent opportunity to answer that second question thanks to the folks at B&H Photo and Olympus. They arranged for me to test the OM-D E-M1 Mark II along with a wide assortment of lenses that fit my particular style and interests, ranging from wide angle to super telephoto. After a month of shooting, I was supposed to send it back. I had to admit that I really, really liked this system. I tried not to. I procrastinated. In January, I got a friendly nudge and again had a lot going on and the post office never seemed to be on the way to wherever I had to go. Sadly, I finally packed up the box and shipped it back. Now, if the good folks at Olympus want to refuse that shipment and send it right back, I would totally be OK with that. Just saying. My first love in photography is, and will always be, wildlife. Venturing out with this “tiny” camera and the 300mm lens I initially felt “under-geared.” Where was my overburdened pack of lenses and equipment? I had a hard time imagining I could get the same results in such a small package as my beefy DSLRs and 600mm+ monster lenses. Although I had some challenges with wildlife in action as outlined below, I was pleasantly surprised by how much reach I had in such a small package. The 300mm paired with a 1.4 teleconverter provided me with enough focal length magnification to capture images of all sorts of wildlife. The 40-150mm also performed well, especially for larger animals. Many of the things that I liked about this system for wildlife also lent themselves well to close-ups and macro style images. In particular, the 300mm and 40-150mm have fairly short minimum focus distances, allowing you to use these lenses to really explore “little worlds” like in the images below. Coming from a full frame camera, I am used to big views of big scenes. I truly did not know what to expect with a micro four-thirds sensor and the accompanying wide-angle lens selection. Although there was some noticeable barrel distortion at its widest, the 7-14mm lens proved very capable for wide angle “big scenes.” In Lightroom, the lens corrections and transform panels generally cleaned up any distortion. One thing that threw me at first in post-processing via Lightroom was the “built-in” profiles Olympus embeds in its RAW files. I was used to working with the drop-down menu that matched the body to the lens. Every Olympus RAW file (ORF extension files) includes a built-in lens profile that is automatically applied in Lightroom to your images for lens corrections. The Olympus has an unobtrusive size, it’s easy to carry, and has the ability to set a high ISO with very low noise in the photos. These are all huge pluses for street and abandoned places exploration style images. Somewhat to my surprise my most used lens while testing the system was the 40-150mm, mainly for its versatility in all sorts of genres. It lent itself particularly well to street photography, allowing me to capture more distant scenes and details without lugging around a conspicuously large lens. Does it fit the type of photography I like to do? Yes. Coming from the world of full-frame DSLRs, I had my doubts. 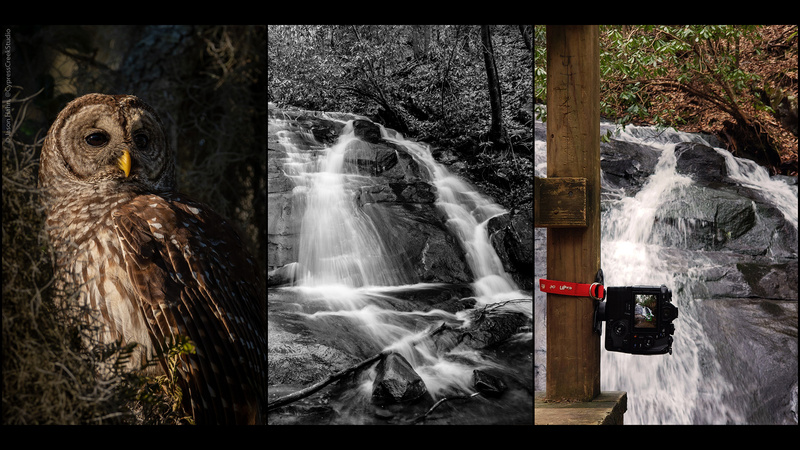 Whether wildlife, landscapes, macro, street, studio, portrait or pretty much any genre I tried, I found the system and lens assortment fit me and my style. Can I take it to the places I like to go? Definitely; I was able to pack it into a case a third the size of the Pelican rolling hard case I usually use for travel. In the field, a daypack carried everything I needed, with space and weight to spare. Will it survive me? I used this kit in conditions from cold, rainy days to ones abusing me and the system with sweltering heat. In the swamp, at the beach, on mountains, near waterfalls and even in … cities (eww). The camera and the lenses have been checked through airlines in my luggage, thrown in backpacks for long hikes, and has ridden around in the back of my truck on the bumpiest washboard roads you can imagine. In that time, I had two error messages appear. Cycling the power on the camera cleared them up each time. Will it replace something I already use and do a better job? Money being no object, yes, I would jump to mirrorless with no objections. This Olympus system would be a strong contender. But unfortunately, money is a consideration. It is expensive to switch systems. Before jumping ship, I would certainly look at my current brand’s options to see if I could save and use my existing lenses. Will it help me get the shots I want? Yes. Having gone through medical issues that have sadly, limited my ability to schlep heavy gear into the field, it was refreshing to have such a lightweight but extremely capable system. It is fast, durable and produced images with which I am very happy. Its compact size made the Olympus easy to mount anywhere, my Platypod paired perfectly with it. Menu system: From the start, I wasn’t in love with the menu system. I often found it hard to navigate, spending more time trying to find what I wanted than I had expected. It certainly could in part be because I have been a Canon user for so long that the differences in menu layout and terminology between the two systems are significant. Battery life:One of the biggest issues I encountered was battery life, I burned through batteries pretty fast. The electronic viewfinder, image stabilization and the live view back monitor all consume a lot of power. Sure. I am being picky here, battery technology has been one of the largest tech leaps in the past few years. But I want even more! It was not uncommon for me to exhaust 2-3 batteries per day. Too many features: I like a camera to be full-featured. One of my big pet peeves is when manufacturers try to cram too many options into a camera body. I think of a camera as a tool to make the images I want to make. I use a screwdriver to put in screws. I don’t need or want it to hammer in nails, paint the walls, or wash my dishes. Actually, the dishwashing thing would be pretty nice and I digress. Adding more and more features makes it increasingly difficult to find the features I want. While undertaking this exploration, I miss images. I think that when there are so many options and features, it can become overwhelming for the average user. This is an across the board issue I have found with nearly all of the mirrorless systems on the market. I would love a simplification that streamlines activating features, instead of such emphasis on the length of the features list and how many can be shoved into the camera. Autofocus options: After two months, I still felt like I had not figured out the nuances of the Olympus autofocus system. To my point above, there are almost too many options, you can over-refine your focus to the point of it becoming nearly useless. The autofocus on the camera is great. It is snappy and quick, but the numerous array of options for autofocus left me confused about which to use. Size: As much as I loved the lightweight and packability of this system, making the jump from my Canon 5D Mk IV made it feel like a toy in my hands. Most of the time this was not an issue, I rather liked the reduced weight and size. But the small buttons were hard to operate in colder weather with gloves on, and I found myself in the heat of the moment missing or fumbling with buttons and dials. Yes. Overall I found that this Olympus system was very capable, produced great images, and handled everything I threw at it. I honestly thought Olympus wasn’t much of a contender any longer in the professional photographic world until this project came along. Olympus is a sleeping giant that has a very impressive lineup of cameras and lenses that I wouldn’t hesitate to use again. Camera choice is as much about personal preference as anything, but when trying to decide on a mirrorless camera system, I think this one fits the needs of nature photographers, as well as nearly every other genre, extremely well. A long, long time ago, my very first digital camera was an Olympus point and shoot, the CZ3030. At the time, it was at the leading edge of digital technology. A “huge” 3.3 megapixels, a 128MB smart media card, and nearly 2 frames per second. I still have it. It still works. I love the full circle I’ve traveled from that camera, which I never would have imagined was my gateway to my cherished career in photography, to getting to review Olympus’s flagship mirrorless camera body all of these many years later. A photo of my son made many moons ago with my first digital camera, an Olympus CZ3030.